Thai Chili Meatball Sliders with Peanut Slaw. Sticky sweet, amazingly fragrant meatballs in Thai chili sauce, served in fluffy buns over a killer easy peanut butter Asian coleslaw. So many foodie roads collide in this recipe that is ridiculously easy to prepare. So, a funny thing happened, right after I published my recipe for Barbecue Meatball Waffle Sliders. 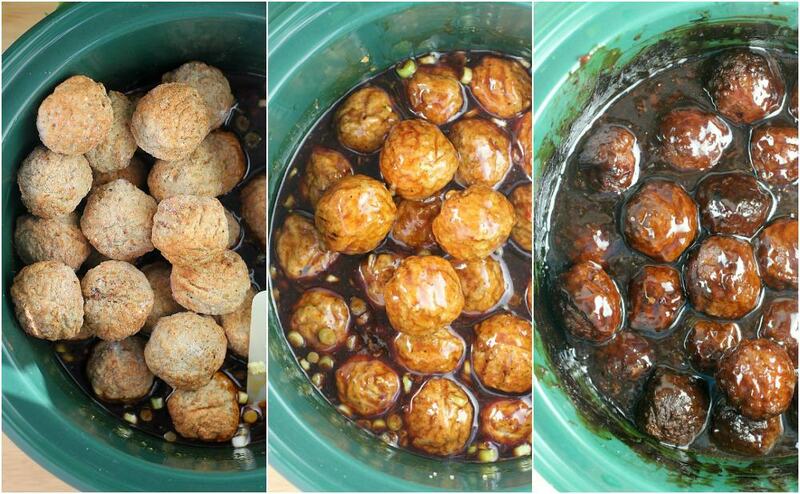 …I got an opportunity to work with Cooked Perfect Meatballs. In those photos from that BBQ slider post (with which, I am quite pleased), those are Cooked Perfect Meatballs too. But now, I had to come up with a new recipe using them. ..Ahhhh, what to make, what to make… Last time, I gave you mini sliders, intended as party food or such. So this time, I stayed in that general realm with something that would be just as easy for a party, but this recipe could be dinner as well. Besides, who doesn’t like a meatball sub?? 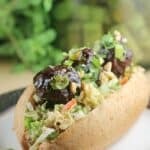 This Thai Chili Meatball Sliders with Peanut Slaw recipe is very straightforward and quite fool proof. And it is prepped in the slow cooker, our best friend this time of year, right? …We just throw the sauce ingredients in the crock, add the meatballs, and let that go. Meanwhile, we make an Asian coleslaw to with. …See where I’m headed here? Can you feel it? Asian BBQ meets Thai Chili wings like my husband always gets meets old fashioned, slow-cooked meat and slaw. Like a Texas-Asian fusion thing, there is THAT much going on here. I have made a similar slaw with this peanut butter dressing previously with some chicken sliders. It is so good. Especially in a slider situation. And I went with Thai chili for the meatballs because my husband always, without fail, orders Thai chili wings at a local restaurant we go to quite often. Tasty tasty. Put the two together, and here we are with a fantastic flavor combination. So that’s it folks! Thai Chili Meatball Sliders with Peanut Slaw. Easy Cooked Perfect Meatballs, heated in the slow cooker to Thai chili greatness. Then served over peanut slaw in a little sub situation to take it all to the next level. YUM. 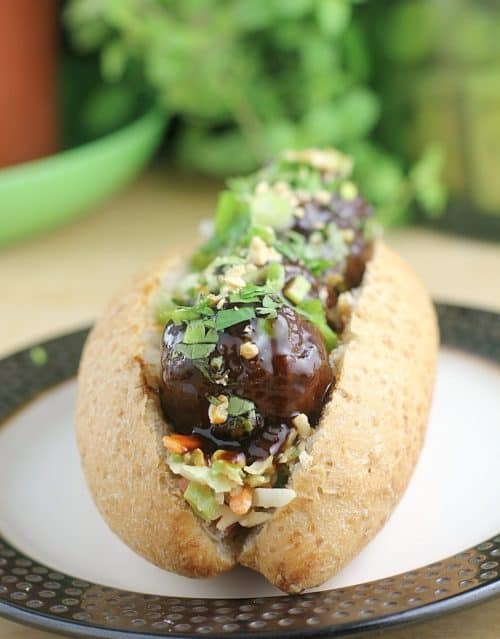 Thai Chili Meatball Sliders with Peanut Slaw. 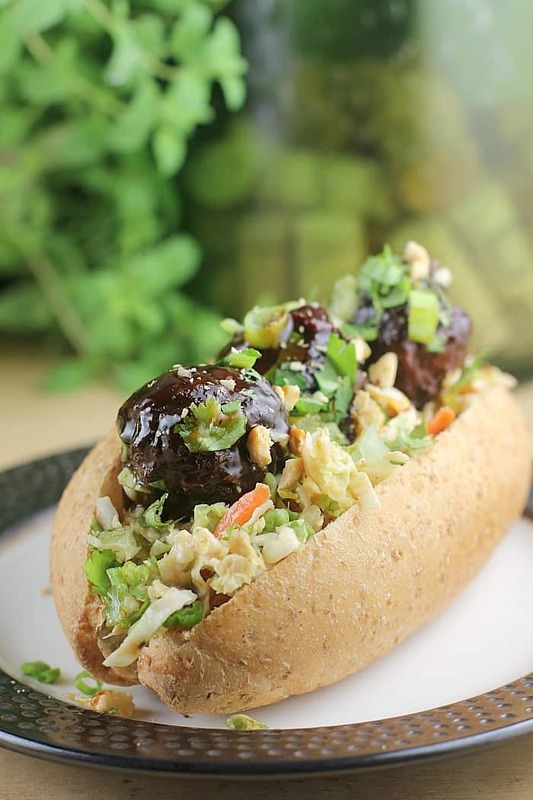 Sticky sweet, amazingly fragrant meatballs in Thai chili sauce, served in fluffy buns over a killer easy peanut butter Asian coleslaw. Combine all of the Thai Meatball ingredients in a slow cooker EXCEPT the cornstarch. Set heat on low, and let it go 6 to 8 hours. Or 10. Whatever. Dissolve the cornstarch in 1 Tablespoon water and add to the sauce. Let the mixture thicken 15-20 minutes. Meanwhile, prepare the slaw. 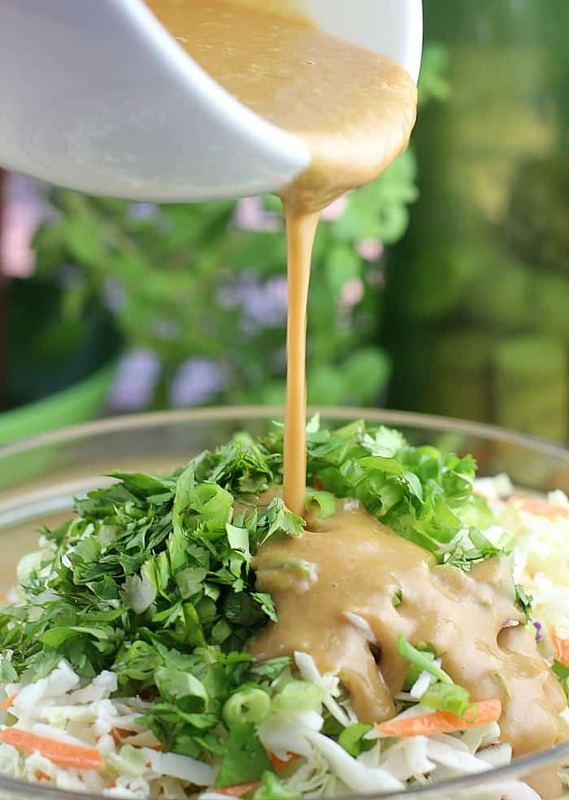 Combine all the ingredients for the dressing (everything from peanut butter through the lime juice) in a bowl. Toss in the coleslaw, cilantro, and green onion to coat. Set aside in the fridge to chill for a couple hours and let flavors combine. Once everything is awesome, slice the sub rolls. Add a layer of Asian coleslaw, then meatballs. Garnish with green onions and peanuts. Yields: 6 servings. oh my yumminess – this sounds amazing! 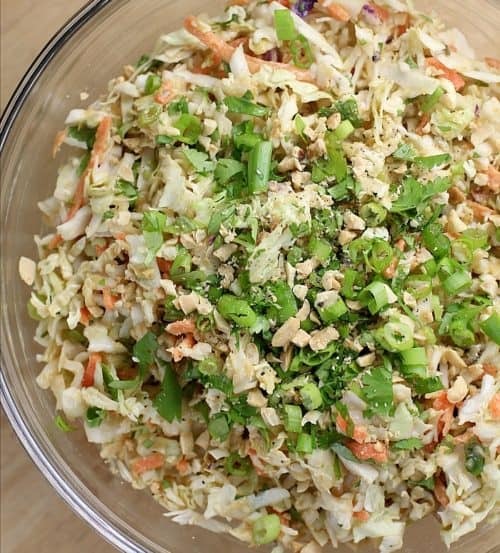 I LOVE peanut slaw AND thai chili – I need to try this asap! 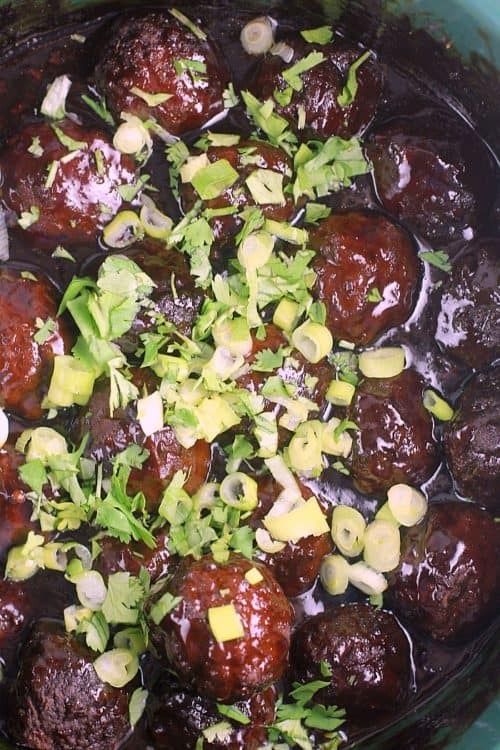 I am vegetarian but may need to try this with veggie “meatballs” — it looks like a great recipe! These look amazing! I’m always up for trying something new! Not sure if my kids would like due to pickiness but the hubby and I would!! I love a quick and easy meal anytime!! Oh wow, those flavors sound so good. 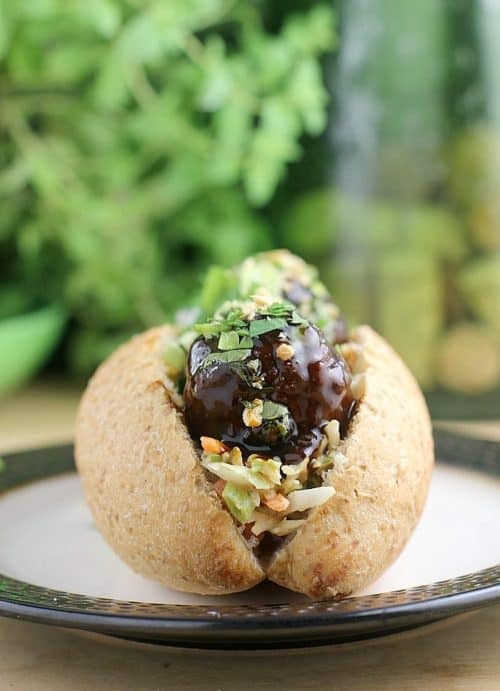 I think the guys would be super excited to try a new meatball meal like this! This sounds so good. Such a treat! We love meatballs. Ill have to try these out! I love this meatball slider recipe. The peanut slaw sounds delicious too. I will look for that brand of frozen meatballs when I shop this weekend. These meatball sliders look so good. I would really enjoy these for lunch or dinner since it has such great flavors. These look super yummy. My little one will enjoy helping me make them for this daddy. This looks so delicious! I would love one of these sliders for lunch today, the combination of flavors sounds perfect! Now, doesn’t this make cooking super easy! They look like they’re really tasty meatballs. You’re very creative with the recipe! It looks so good. I’ve never tried this brand before, they sound great! I think it’s a lovely recipe, especially since I love Thai flavors!